Juniata College has a tradition that accompanies Madrigal, our winter dinner and dance, called “Tenting.” Tenting begins when an e-mail is sent out to the entire student body, who race to the lawns in front of Ellis Hall to set-up camp for the next week. The order in which students arrive and set-up their tent determines students’ place in line for Madrigal ticket sales. For example, the first students in the tent line (otherwise known as the “head tent”) receive their first choice table at Madrigal, second tent gets second choice and so on. Juniata students typically camp out with their friends and those they wish to share a table with during the Madrigal dinner. The maximum number of people per tent is ten. Dinner tables cannot surpass 6 or 8 people. Students who do not plan to attend the dinner may still attend the dance. Dance tickets will be on sale at the Information Desk starting the Monday after Madrigal ticket sales begin. 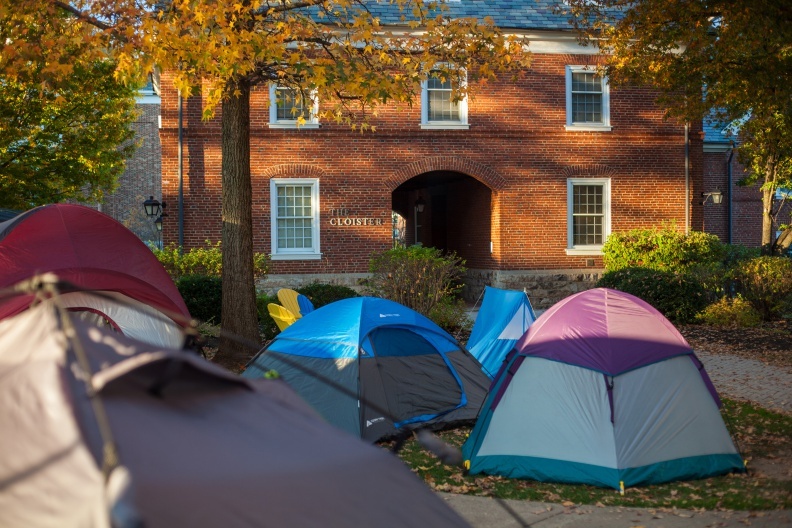 An email will be sent to the entire campus in the near future permitting the start of tenting outside of Ellis Hall. Tents may not be set-up ahead of time, so tents should remain “in pieces” as your team races to Ellis Hall. Tents may be set up on the quad side of the Cloister arch. The entrances to surrounding buildings and the sidewalks should not be blocked. Extension cords may not run across Scott or 18th Street. Only outdoor extension cords may be used to provide electricity to your tent. The Madrigal Committee will not be responsible for monitoring the order of the line. It is up to the participants to keep themselves in order and/or work out any conflicts in a responsible manner. Before students may purchase their tickets on the day ticket sales begin, all tents and personal items from tenting must be cleaned up. Anything not removed from the lawns by 10:00 a.m. on that day will be discarded. All rules in The Pathfinder, including the alcohol policy, apply during tenting. Violators’ names will be given to the Dean of Students Office. The Madrigal Committee reserves the right to cancel the sign-ups and implement an alternate sign-up format of our choice, if any violations of college policy and/or concerns for the participants’ safety occur. Ticket will cost $15.00 per Juniata student and $20.00 for all non-JC students (for the dinner and the dance). Make sure to have all Juniata ID numbers before sign-up and if there are any dietary restrictions (vegetarian / vegan option). Tickets for the dance (without the dinner) will cost $10.00 in advance and $13.00 at the door. To sign-up for a table after the first day of ticket sales, please stop by the Information Desk in Ellis Hall. Students may sign-up for tickets in “tables” of 6 or 8 students. If you would like to attend and do not have a complete table, the Madrigal committee will assign you and other students to a table, so all the tables are filled. While JAB and the Madrigal Committee oversee the week, all activities are set up and planned by the head tent. Want the responsibility and the fun of running the week? Start practicing your tent raising skills now! Remember, no pop-up tents allowed, all pieces must be put up and put together after the official start time. These rules are subject to change up until the tenting meeting in October or November, an official list of rules will be sent out to tenters and provided at the meeting.